Description: Union Pacific 4423 Southbound freight at Steilacoom. Description: a Union Pacific train on trackage rights westbound at Merrick. Which is west of Emporia KS. Description: NS 58Z heads north between CP-79 and CP-78 on the Marion branch bound for Elkhart. Description: With an Ex SP SD7 on the left and an Ex SP signal bridge on the right, a certain SP nostalgia hangs in the air. Description: Two SD70Ms roll a long line of vehicle frames east to the Arlington General Motors plant. Description: CSX C40-8W 7721 and UP SD70M 5118 roll NB with a line of autoracks on the early morning of November 14, 2014. Description: CSX C40-8W 7721 and UP SD70M 5118 roll NB at Tyrone, GA on the early morning of November 14, 2014. Description: UP SD70M 5118 passes the gates at Valleywood Rd in Tyrone, GA.. Description: UP SD70M 5118 passes the Valleywood Rd grade crossing in Tyrone, GA.. Description: CSX C40-8W 7721 and UP SD70M 5118 pass the Valleywood Rd grade crossing on the early morning of November 14, 2014. 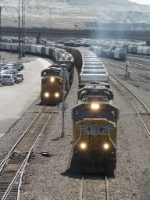 Description: Union Pacific. # 6413 southbound stopped on the siding just west of the US-101 / Ventura Fwy overpass. Title: UP 7477 Screams east with a stack train in tow.